Musigny is one of the crown jewels of Burgundy, with the vineyards dating back to the 11th century. This is a small grand cru, just 10.8 hectares; the total area is smaller than most single chateaux in Bordeaux. I am intoxicated by the perfume of Musigny and seduced by its silky texture and ethereal flavors. When given a choice to drink any grand cru from Burgundy, in most cases I choose Musigny. Among the ten producers of Musigny, Roumier and Faiveley are the smallest owners. With only .1 hectare of Musigny, Domaine George Roumier has one of the smallest parcels in this exalted grand cru vineyard. Bottles are rare and have price tags to mach. 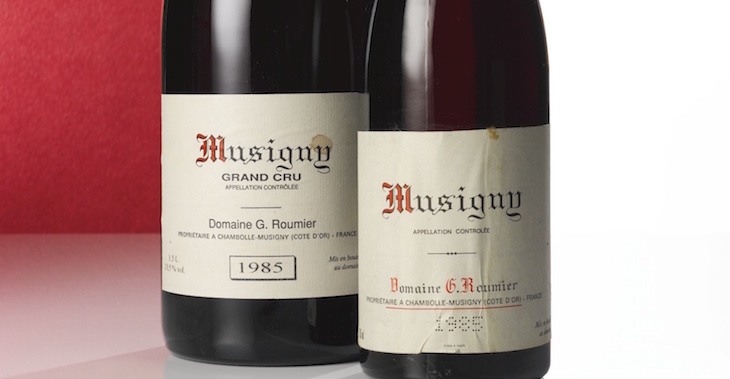 While Roumier’s Musignys are terrific, their prices are exorbitant and I would not urge people to purchase these wines unless they have an unlimited bank account. I was fortunate enough to taste a vertical of Roumier’s Musigny in November 2016, including vintages going back to 1979. These delicate beauties age extremely well and I was enchanted with the Musignys from the 1980s – from the fabulous 1983 (a real surprise) to the structured 1986 and the elegant 1980. This vintage has amazing purity and focus. Typical of Roumier’s Musignys, this young, medium bodied wine has a sensual, delicate character that belies its core minerality and fine line of acidity running through it. There is finesse and elegance here along with a lingering finish. Best after 2022. There is a wonderful intensity of flavors in ths young Musigny. Supported by silky tannins, the flavors range from roasted Provencal herbs to black cherries, nutmeg and wild strawberries. This vintage combines power and finesse with all the wine’s key elements in balance. Beautifully composed wine fully deserving its grand cru status. Unlike the 1993 or the 1990, the 1997 Musigny tastes older. This wine is at its peak, with gentle tannins and layers of tobacco, mushrooms and dried berries on the palate. The finish is not long but there is Roumier’s classic delicacy, purity and finesse, even in a vintage like 1997, which was waved aside by critics. The 1993 is still so youthful that one can still find primary dark berry fruit on the palate. There is wonderful tension and energy in this vintage with an intense core structure of tannins and acids. The dried herb and dark berry fruit surrounds this structure and offers a glimpse into how this tightly knit Musigny will evolve with another several years in bottle. The wine reveals its quality in the long, lingering finish. The 1988 vintage has an herbal tone with restrained flavors that are not that impressive on the nose. But the palate is delightful – sensual, ripe tannins intertwine with flavor of dried blackberries, thyme and earth. The wine rises to a crescendo in the finish and lingers for more than 15 seconds. This is a vintage that piques my curiosity and makes me want to revisit it again to taste its evolution in a year’s time. There is a sternness to the 1986 Musigny with pretty firm tannins for a wine that is over 30 years old. The palate is attractive with the flavors very intense and quite powerful. Dried herbs are interlaced with black truffles and dried rose petals. The finish and mid palate reveals a wine that will go on and give pleasure for another decade. This vintage is a disappointment given the reputation of this grand cru vineyard and the producer. There is little sign of the silkiness and supple texture found in Roumier’s other Musigny vintages; here the tannins are grippy, almost chewy. The palate offers roasted herbs, dried dark berries and mushrooms. If the wine was young, one would conclude the wine needs time to open up but after 33 years, this is as good as it is going to get. What a wonderful surprise! The 1983 is sensational – beautifully evolved, linear, pure with lovely detailed flavors. This is classic Roumier style: not forced, ethereal, gentle and always elegant. The tannins are silky and the evolved dried floral and herb notes present the feminine side of Musigny. The 1980 Musigny is past is peak but fading slowly and elegantly like a grand dame. Those who prefer their wines will primary flavors may not appreciate the ethereal dried flower and savory spices in this wine but I am a fan. The tannins are silky, the flavors delicate and light with a lingering finish. The bouquet is like inhaling a fresh bowl of pot pourri. This is a delicate Musigny that is past its peak. There are sweet dried berries and silky soft tannins that offer pleasure for those who love evolved Burgundy flavors. But the finish is not as long as other vintages. This vintage was one of ten Roumier Musignys tasting in a vertical flight and it was one of the weakest vintage. A wine to drink up as it is fading, not just when it was poured but even in the glass.